In order to improve the performance of AUVs in terms of efficiency and maneuverability, researchers have proposed biomimetic propulsion systems that swim using flapping fins rather than rotary propellers. This calls for the exploration of unique locomotion characteristics found in a variety of fish for use in underwater robots. (Sfakiotakis et. al., 1999) present a good review of fish swimming modes targeted at roboticists interested in aquatic locomotion. A classification scheme of fish locomotion mechanisms, originally presented in (Lindsey, 2006) and was modified in (Colgate & Lynch, 2004), is shown in Fig. 1. The three main swimming styles are characterized by undulatory body motion, undulatory fin motion, and oscillatory fin motion. 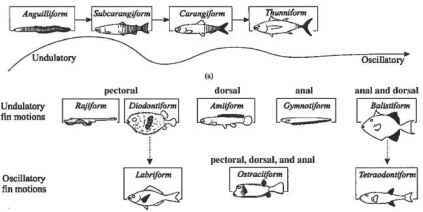 A more traditional classification is one proposed by Breder (Breder, 1926) that broadly identifies two styles of swimming: one is Body and/or Caudal Fin (BCF) locomotion, and the other is Median and/or Paired Fin (BMP) locomotion. Fish classes that use varying degrees of body undulation and/or caudal fin oscillations for thrust generation are examples of BCF swimming, and fish that use paired fins like the left and right pectoral fins, dorsal, and ventral pelvic fins for thrust generation are classified under the MPF swimming style. Fig. 1. Fish Classification based on swimming styles (Lindsey, 1978 & Colgate, 2004). MIT's Robotuna marked the beginning of the biomimetic approach in underwater vehicles (Triantafyllou & Triantafullou, 1995). Barrett et. al. (Barrett, et. al, 1999) demonstrated that the highly articulated robotic fish experienced less drag with undulatory motion than that seen without body undulation. Zhu (Zhu, et. al, 2002) also identified a vorticity control phenomenon, which explains the interaction of the vortices shed by the undulating body and the ones in the wake shed by the tail fin. Such interaction of the body with the wake was also shown to reduce the muscle activity in fish (Liao, et. al, 2003). Anguilliform requires a greater amount of body undulation and thus more degrees of freedom must be connected in series to form a robot. Mclsaac and Ostrowski (Mclsaac & ostrowski, 2003) studied motion planning and control of a serial chain robotic eel. They generated gaits (time functions of the joint angles) for the straight and turning motions of 3-link and 5-link robots. Maclver (Maclver, et. al, 2004) presented some aspects of underwater vehicle design in the areas of sensing and motion mechanisms of a knifefish in (Epstein, et. al, 2006). The Biologically Inspired Robotics Group at EPFL presented a swimming and crawling robot, BoxyBot (Lachat, et. al, 2006) that is "loosely inspired by the boxfish". The focus there was to mimic boxfish-like switching of swimming modes under different speed ranges. More recent biologically inspired robot designs include Basilisk lizard like water running robot (Floyd, et. al, 2006). Recently, a new class of biorobotic underwater vehicles based on the biomimetic principles of flapping foils are being designed. These platforms employ fin designs and motion kinematics that are the result of experimental and computational fluid mechanics work. Licht et. al. (Licht, et. al, 2004) presented the design of a vehicle platform with four heaving and pitching foils. A team of ocean engineers, fluid mechanists and biologists proposed a concept vehicle taking advantage of high efficiency foils in combination with articulated pectoral fins with rays for enhanced maneuverability (Fish, et. al, 2003). Pulsatile jet formation loosely inspired by squid is presented in (Mohseni, 2004). Kato's Bass III (Kato & Wicaksono, 2000) is the latest 3 DOF pectoral fin based vehicle designed for low speed precise maneuvering. Bandyopadhyay (Bandyopadhyay, 2005) presented a comprehensive review of approaches on various fronts of biomimetic underwater vehicle technology like high lift generating fin hydrodynamics, vehicle maneuverability using pectoral fins, musclelike actuators and neuroscience based control. Fig. 2. Bio-inspired robotic fish with multiple fins. Most Autonomous Underwater Vehicles (AUVs) today are larger ones applied extensively from environmental monitoring to oil and gas exploration (Yuh, 2000). However, these AUVs are not suitable for applications where the vehicle has to explore confined spaces like ship wrecks or oil pipe lines, where maneuverability and stability are more important than speed. 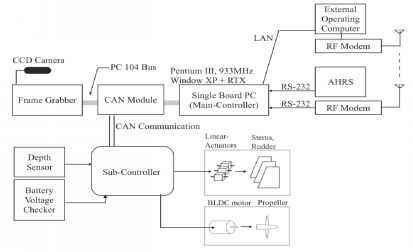 Tasks such as these call for designs that are small, maneuverable and precisely controlled. The work presented in this chapter is a step towards realizing such Micro Underwater Vehicles(MUVs). Here we present the research leading to the design and fabrication of a bio-inspired robotic fish with multiple fins for propulsion and control [Fig.2]. We present the experimental setup for studying flapping fin hydrodynamics and the force measurement results from flexible fins, and we presents the modeling of boxfish-like engineering shapes incorporating key morphological features that are responsible for self correcting vorticity generation as explained by Bartol et. al. in (Bartol, et. al, 2005). A robotic flapper was designed to generate fin motion in three independent rotational degrees of freedom, with a force/torque sensor attached to the base of the fin. The flapper was mounted on a linear stage that was driven a stepper motor. A larger tank was used to allow for linear motion. The tank was filled with refined paraffinic oil. This setup allows us to reply the fin kinematics while measuring instantaneous hydrodynamic forces. The thrust (force in the direction of motion) produced by a flapping fin is a result of its interaction with the surrounding fluid. In the case of simple flapping (for example the caudal fin of a boxfish in cruise mode) this interaction can lead to lift and drag based forces as well as added mass effects (resulting from the deceleration of fluid set in motion by previous strokes). Fig. 3 shows such forces acting on a foil. The lift component (L) of the total force (F) is a result of periodic vortex shedding while the rest of the components are due to drag(D). Fig. 3. Forces acting on an oscillating tail fin. In this study, a boxfish like fin shape was used as the template to vary the fin geometry, therefore its flexibility. To change the chord wise flexibility, the dimensions c1 and c2 have been varied while fixing the aspect ratio and the total area of the fin. This kind of parametric variation displaces the center of pressure of the fin, thus varying the degree of flexing. Fig. 4 shows the shape template used to obtain different tail fin shapes by varying c1 and c2. Four shapes (labeled S1 to S4) from this continuum have been considered experimentally. Table 1 gives the geometric dimensions. The shapes were cut from 0.6mm thick Delrin, 0.1mm thick Polyimide, and 0.6mm thick Polyethylene in order to look at them over a range of material stiffness. In fact, from a flexibility point of view all twelve shapes (four profiles, three materials) form a continuum of flexural stiffness (EI) values, which have a strong correlation to the amount of flexing (Combes & Daniel, 2003). The term captures the elasticity (E, Young's modulus) of the fin material as well as the shape geometry (I, second moment of area) that together determine the fin's flexibility.